There was no turning back. We could only look ahead, toward the road that would bring us back, where all began 1 year ago: Buenos Aires. And then? We didn’t care about the 3,000kms we had until there. The only thing we had on our mind was Kitsos. 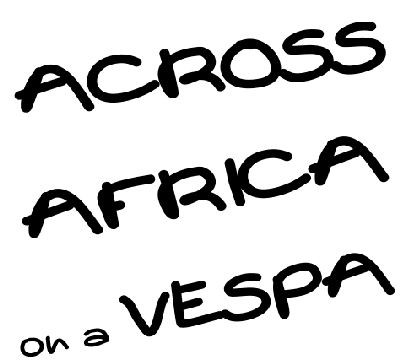 Where would our Vespa stay while we’re gone. We couldn’t bring it back with us to Europe, it was too expensive. We had about 1 and a half months to figure it out, but we couldn’t postpone it. So, we decided to stay on the Ruta 3, the main road that connects Ushuaia with Buenos Aires. 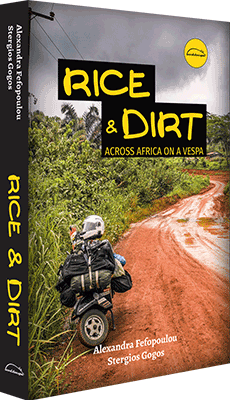 We had read that it is a dull route and that there are more interesting alternatives, but we had to ignore them. A while after we said goodbye to Rio Grande, the freezing wind dried my tears and with no further delay, we reached the border with Chile for one last time. It was the only way to return to the continental part of Argentina, since Tierra del Fuego is divided between the two countries. From Bahia Azul in Tierra del Fuego, we took the boat to Punta Delgada and after 50 more kilometers we finally arrived to Argentina. We had seen on our GPS that there is a campsite in Rio Gallegos, so this was our goal for the day. However, the border crossing and the boat took us longer than expected, so when we arrived at Rio Gallegos everything was closed. We made it to the campsite from a back gate but it was impossible to find any descent food to eat. We were tired and hungry, so we settled for some crackers, but after a while a miracle happened! Our Argentinian neighbor, who was camping with his family, probably understood our problem and came with a plate filled with meat and baked potatoes. He offered it to us with a wide smile. The Argentinian hospitality made our day again! What happens if I fall asleep here? 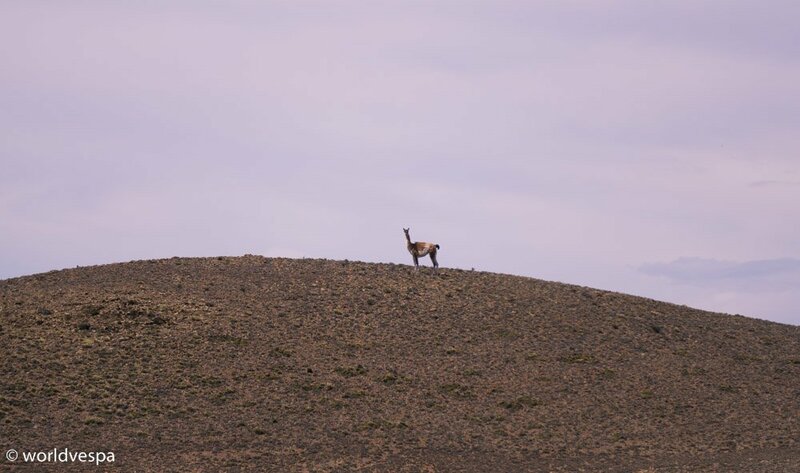 The rules of the game are easy: 1 point for every guanaco we spot. At the end of the day, whoever has more points wins! We continued on the Ruta 3 and late in the evening we reached Puerto San Julian, a small and tidy town with a municipal campsite just next to the sea. Great for a night sleep and off we went for our next destination. The Patagonian landscape from the Ruta 3 was exactly what we had expected: windy and dull. The road was an endless straight line, not changing for many kilometers and the vegetation scarce and at a very limited variety of colors, all of them shades of brown. The only interesting activity was trying to avoid collision with the trucks whose drivers seemed to have gone for Vespa-hunting. When there were no trucks available to play, we had also made up a different game. Its rules were simple: We were keeping score for every guanaco (type of llama) and ñandú (type of rhea) we spotted! It was 1 point for every guanaco and 3 for the ñandúes – trickier to spot. The distance we wanted to cover on a daily basis was between 350 and 450 kilometers and that made our day on the road, long and tiring. At least, for the last kilometers from Puerto San Julian to Rada Tilly, a holiday resort just outside the city Comodoro Rivadavia, we drove next to the Atlantic Ocean which made our travel a bit more interesting. From the municipal campsite of Rada Tilly to the town of Puerto Madryn, we had 450 torturing kilometers, but when we got there exhausted, we realized that we had arrived at a very popular summer resort full of holidaymakers. The only campsite was exactly the type we hated: huge, with all-inclusive facilities – restaurants, bars, cafeterias, shops, restricted number of toilets and showers and of course, impolite staff. Additionally to this, we had to pay a ridiculously high fee which it was too late to avoid. It was already dark, thus dangerous to continue on the road to find a place to pitch the tent. Weak lights and trucks on the Ruta 3 can be a lethal combination. So, we paid and entered the holiday hell. The next morning we were the first to wake up, pack our stuff and run away! In San Antonio Oeste, we finally found some peace. About 300 kilometers from the noisy Puerto Madryn, we arrived at the municipal campsite of this quiet town and collapsed at last! 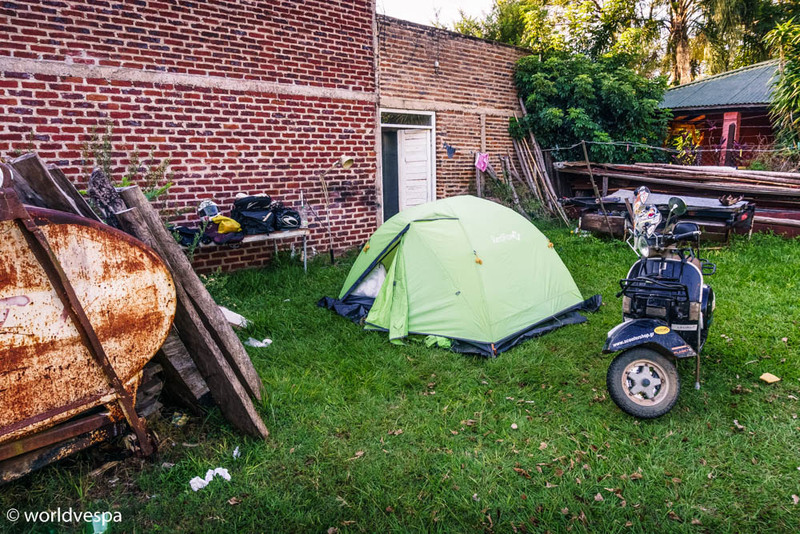 The campsite was cheap, old, ugly, neglected and almost empty: our favorite kind of campsite! We stayed there for 2 days because we were so tired that it was impossible to wake up and go the next morning. 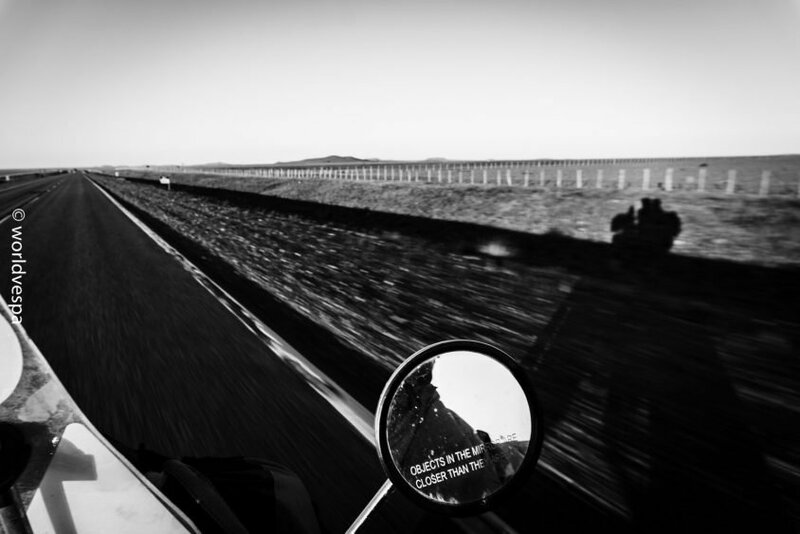 This break gave us the energy we needed to continue for another 400kms to Bahia Blanca. We were now in the Province of Buenos Aires and the scenery had started to change. The scarce, brownish vegetation of Patagonia had given place to a greener and fresher landscape, this of the Argentinian pampa. The “pampas” are the South America’s vast fertile plains that start from the Province of Buenos Aires and go up to the southern regions of Brasil, including Uruguay. The climate there varies from semiarid – on the western fringes to subtropical in the north, however generally temperate. It was midsummer and we could now feel the difference in temperature as we headed north to the city of Buenos Aires. 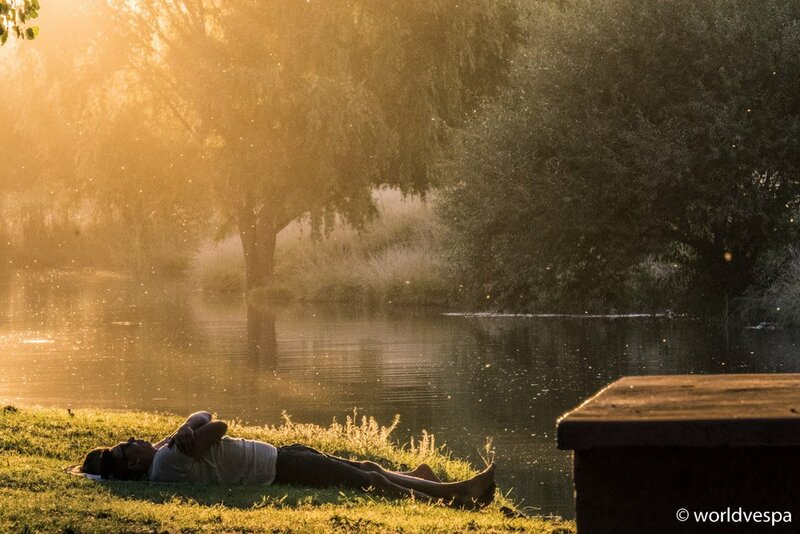 Camping: Our favourite type of accommodation! 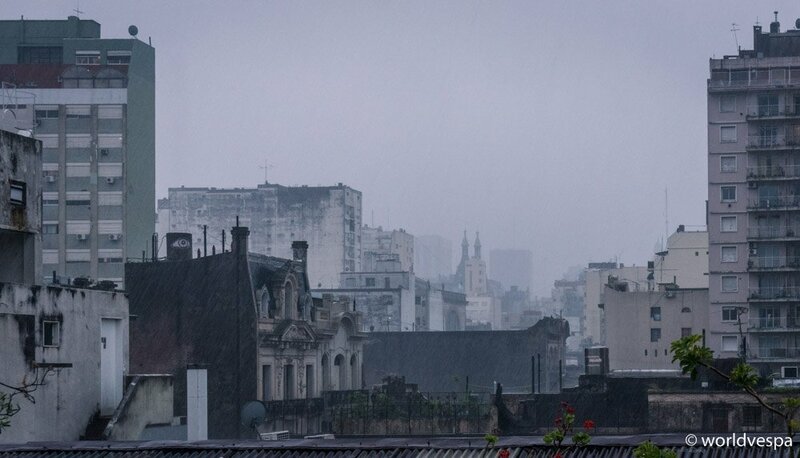 The last day on the road, before we arrived at Buenos Aires, was a bit melancholic. We spent it at the municipal campsite of a town called “Azul” (which means “blue” in Spanish) and even its name couldn’t be more fitting to our mood. Our last night in the tent was a peaceful one, next to a small river, enjoying the sounds of nature for once more, before we got to the big city. 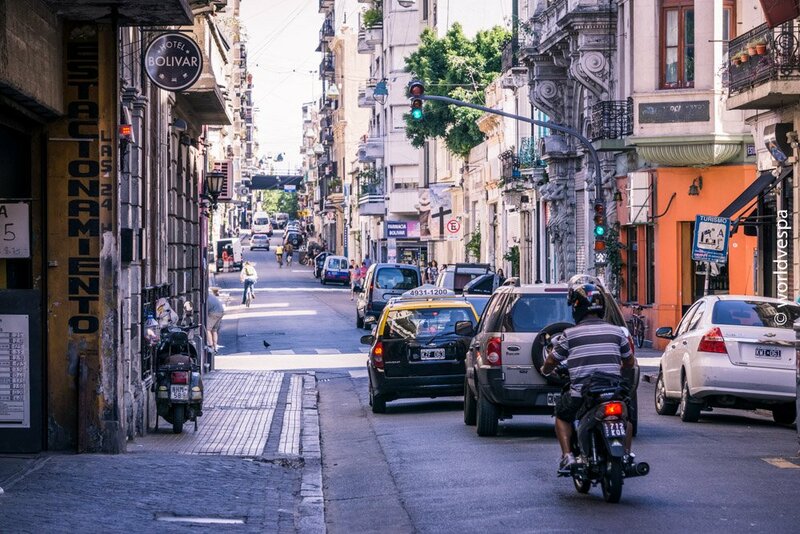 It was early afternoon when we saw our old neighborhood in the heart of Buenos Aires. We parked outside Hotel Bolivar, the place where we stayed the last time we were here and it seemed like nothing had changed. I rushed into the building feeling like I was returning home and 10 minutes later, we were in our room on the last floor of the old building. We were happy to see again people we knew. Especially when the baker from the “panaderia” we used to buy our “medialunas” and “empanadas” remembered us, we felt we were part of the neighborhood. 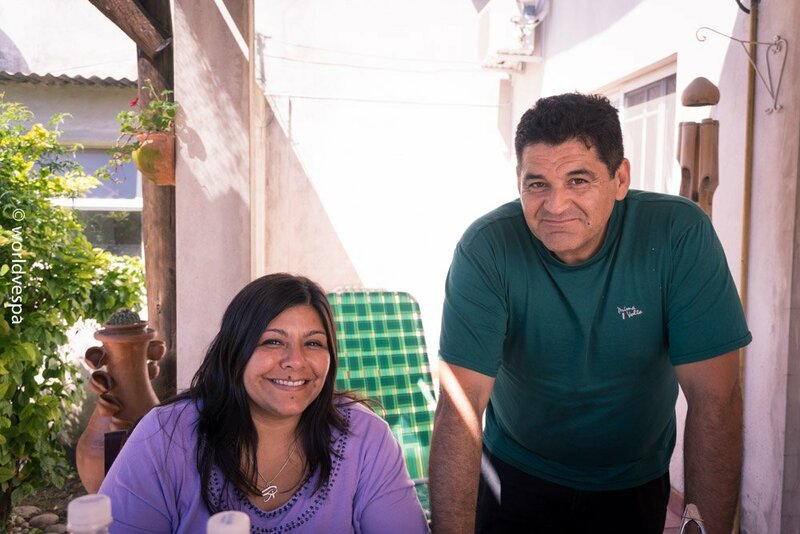 We soon reunited with our friends Jose Luis and Silvina – a couple we had met the last time in Buenos Aires – and started making plans about our last month in Argentina. We were happy to see again people we knew! 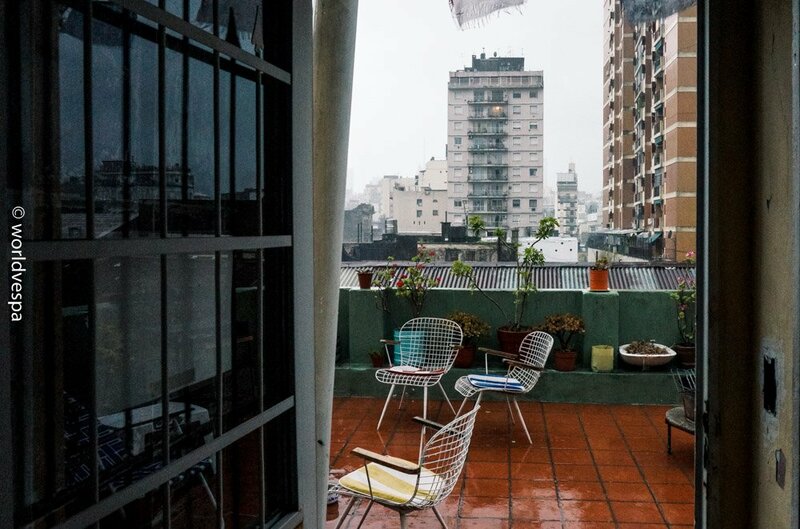 We had decided to make the best of this last month in Buenos Aires. 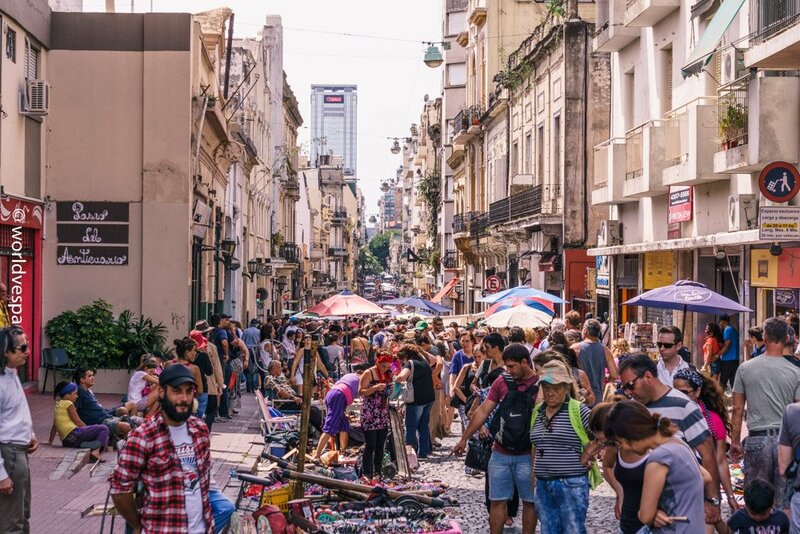 We went for our favorite walks in the city center and in Puerto Madero, we roamed in the streets of San Telmo, we enjoyed cold beer in our favorite bars and we ate all the empanadas (small stuffed pies) and medialunas (croissants) we could! We also had the chance to meet with Silvina and Jose Luis and indulge in the traditional Argentinian “asado” (barbeque). However, we had a lot of things to worry about and many more plans to make, but first things first. We couldn’t leave for Europe without having sorted out what we’d do with the scooter. It was too expensive for us to ship it back, but additionally to this, leaving Argentina wasn’t the end of our trip. Our plan was to continue for as far as we could go. We started calling all the people we knew and visiting all the customs/immigration/tourist offices. 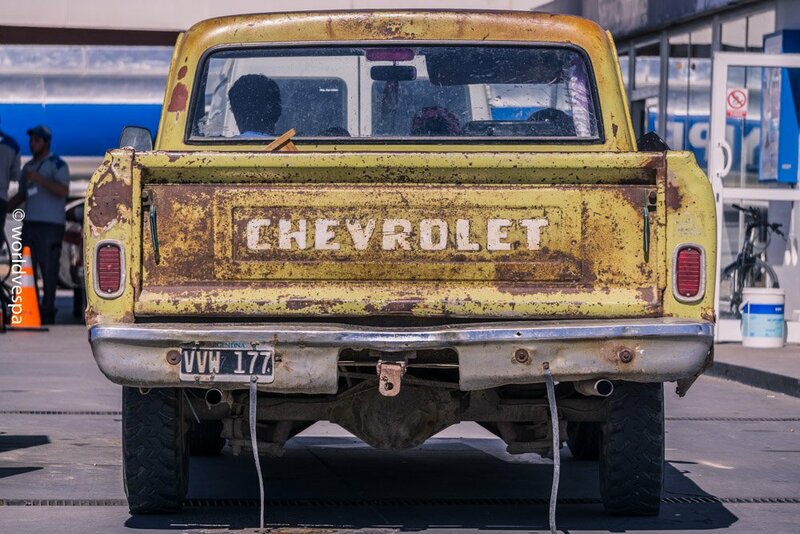 After some serious consideration, we realized that it was too risky to leave our vehicle in Argentina. According to the law, all vehicles with non-Argentinian plates can stay in the country for up to 8 months and after that, the owner must drive outside Argentina to a neighboring country and enter again in order to renew the temporary permit. In case of overstay or if the driver who crosses with the vehicle through the border isn’t its owner, there is a high risk of confiscation accompanied by fine! We wouldn’t jeopardize getting into trouble with the law and lose Kitsos! The thorough investigation we did led us to this conclusion: Brazil was our best option. For some reason, there are no papers of temporary stay needed for a vehicle in Brazil, so we had to ride the Vespa and leave it there. But where? The solution came from the club Scooteria Paulista. The guys from the club had contacted and invited us to Sao Paulo several months ago, when our story traveled through the Vespa community of South America and now it was time to meet them! 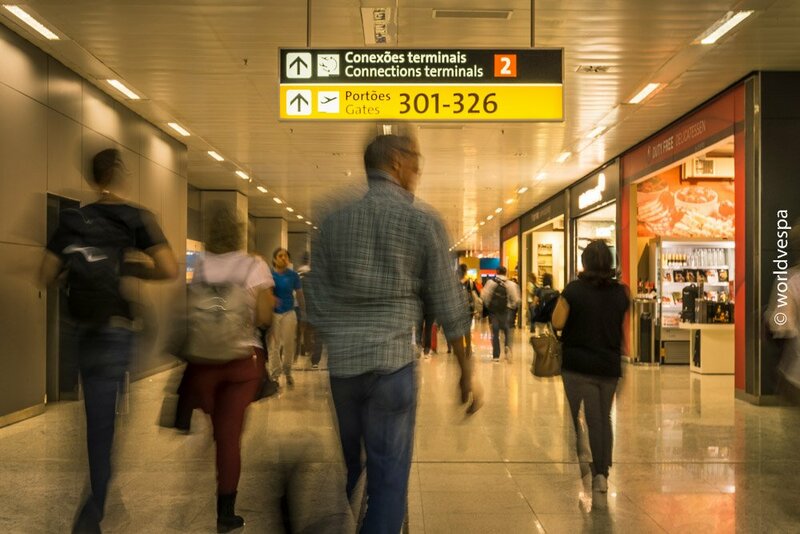 Braziliana are “notorious” about their hospitality: they have this reputation of being so open and hospitable to other travelers, that it is difficult to get away sober! Unfortunately it was only Stergios who’d have the opportunity to be introduced to the Brazilian culture. We decided that he’d travel alone and I’d stay in Buenos Aires. 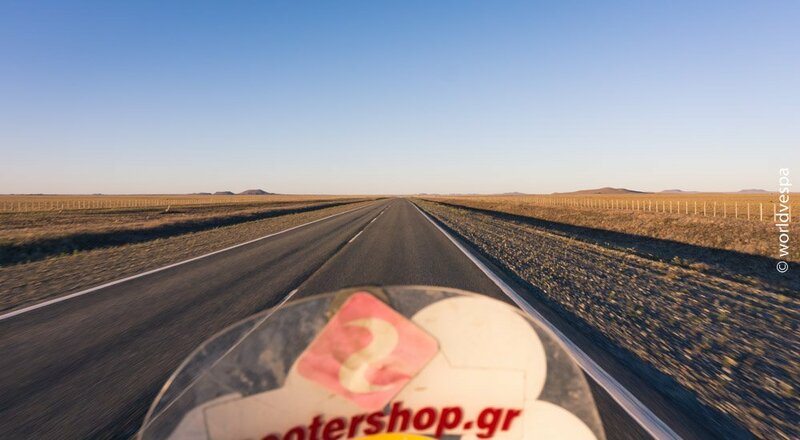 The 2,300kms distance to Sao Paulo could be easily covered by Kitsos, the Brave Scooter and Stergios would be back in approximately 10 days. The plan was to ride first to Curitiba, where he’d attend the annual scooter club meeting – which happened to take place those days – with the guys from Scooteria Paulista and then, they’d ride as a group to Sao Paulo. So, the departure day came and I found myself waving goodbye to Stergios, trying to breathe hidden in the white cloud of 2-stroke oil and pure quality petrol that Kitsos left behind… Hasta luego! Scooters and more scooters in Brazil!